In one brutal riff after another, Hillary Clinton displayed her contempt for a man clearly unfit to be president. Game over. Hillary Clinton will be the next president of the United States. The last presidential debate—fear and loathing in Las Vegas redux—was a beatdown. Clinton didn’t win on points. She pummeled Trump relentlessly, smacked him with lethal combinations, stuck him with sneak punches and low blows, batted away his lame counters, and left him bleeding and sputtering. If he was on his feet at the end, it was only because he had a lectern to hold onto. This morning, headlines feature Trump’s petulant refusal even to commit to accepting the result of the election: “I ‘ll keep you in suspense, OK?” This sent the punditry into a tizzy about “dictatorial instincts,” “authoritarian mentality,” “undermining the democracy itself.” But that gives Trump far more weight than he deserves. Clinton had it right: he’s simply a sore loser: “You know, every time Donald thinks things are not going in his direction, he claims whatever it is, is rigged against him. The FBI conducted a year-long investigation into my e-mails. They concluded there was no case; he said the FBI was rigged. He lost the Iowa caucus. He lost the Wisconsin primary. He said the Republican primary was rigged against him. Then Trump University gets sued for fraud and racketeering; he claims the court system and the federal judge is rigged against him. There was even a time when he didn’t get an Emmy for his TV program three years in a row and he started tweeting that the Emmys were rigged against him.” The Donald couldn’t resist playing up to the part: “Should have got it,” he interjected. Trump ended the night not the noble gladiator, defiant in defeat. He ended it alone, the sad loser, abandoned by his party, refuted by his running mate and even his campaign manager. He has stoked hatreds and divisions that will continue to haunt. He may well be able to create a subscription TV network to pocket millions by spewing venom and fantastic conspiracies into the body politic. But he’ll be remembered as a loser. “Donald thinks belittling women makes him bigger. He goes after their dignity, their self-worth, and I don’t think there is a woman anywhere who doesn’t know what that feels like. So we now know what Donald thinks and what he says and how he acts toward women. That’s who Donald is. I think it’s really up to all of us to demonstrate who we are and who our country is.” Exactly. Since Clinton will be our next president, her policy positions took on more weight. She forcefully espoused major public investment to get the economy moving—in infrastructure, green jobs, advanced manufacturing, education and training. She repeated her pledge to pay for this by getting “the wealthy and corporations to pay their fair share.” She’ll push to bolster Social Security by lifting the cap, so that the wealthy pay closer to the same rates as the rest of us. But she also put harsh limits on the possible. At a time when central banks and the IMF are pleading with governments to spend money to avoid a global recession, Clinton pledged not to “add a penny to the national debt,” and not to raise taxes on anyone making less than $250,000 a year. She boasted of the surplus budgets achieved during her husband’s presidency, ignoring the failed opportunity to begin rebuilding the country and the recession that followed thereafter. These limits reflect the continued dominance of conservative ideology. Americans don’t understand that the debt of a nation that has its own currency is far different than that of a family or individual. Few Democrats, partly because of the Wall Street wing of the party, even try to make the case that public investment will lead to growth and virtually pay for itself. They pledge to “pay for” any program they support, virtually insuring the programs will be underfunded. Ironically, conservatives are not so shackled, touting top end tax cuts, as Trump did last night, promising that growth will cover any deficits. Clinton also displayed her hawkish dispositions. The rhetoric about Putin keeps getting more vitriolic. 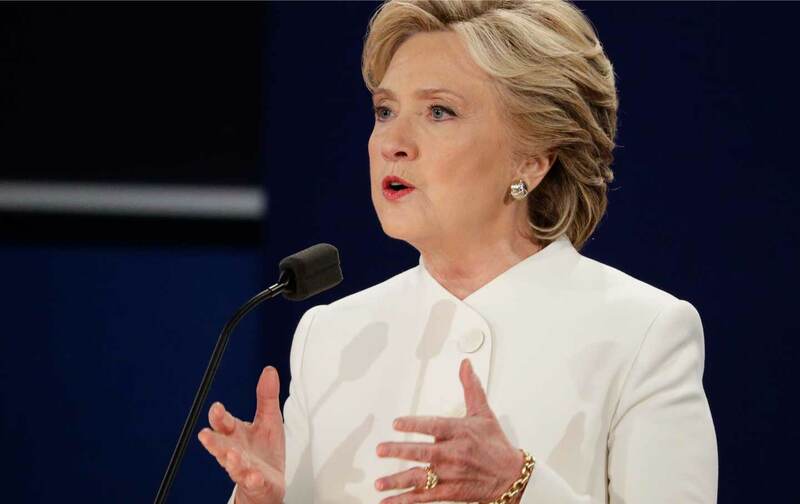 Clinton once more pledged a “no-fly zone” in Syria, dismissing the warning of the head of the Joint Chiefs of Staff that this would threaten war with Russia and Iran. America’s allies have “kept the peace,” she argued, even as the US enters its 15th year of endless wars and no victories. No doubt, Trump should not be in shouting distance of the “nuclear button.” But while Clinton grows more confident making the progressive case on domestic and social issues, she seems intent on doubling down on our failed efforts to police the globe.